We are so excited to introduce the newest addition to our one stroke range! GLOBAL Rainbow Cakes! These gorgeous vibrant colours really stand out in the crowd and with the huge range of colour combinations there is sure to be something to suit everyone's needs! 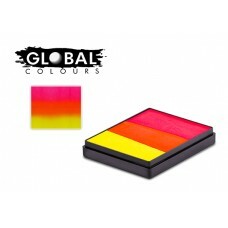 Global Colours was established in 1992. An idea by a young and innovative Australian company was to produce a complete range of the world’s finest quality theatrical makeup.Since then, years of dedicated research and development with makeup artists, performers, face painters, expert chemists and engineers have been essential to the creation of Global Colours – A new generation of water based bodypaint and makeup. All Global Colours Cake makeup utilizes a unique formula which delivers the beautiful, effortless creation of your desire. Global Colours has sourced only the highest quality pigments and additives to assure world class consistency, time and time again. Global Colours offers products with reduced toxicity and impact on the environment with a strong commitment to eco-friendly packaging. 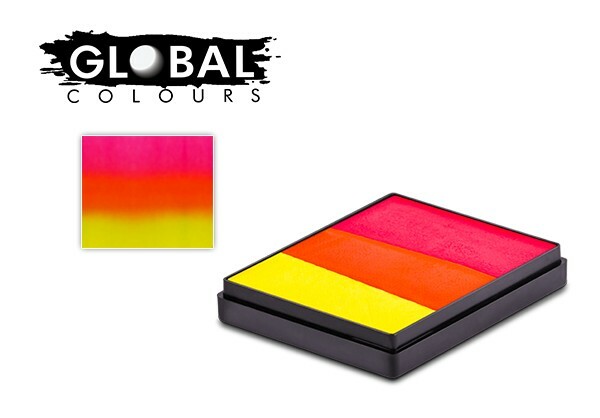 Global Colours produces the highest quality products without compromise and makes them available at the most reasonable price. Use with a half round sponge or large flat or filbert brush for best results!